Fruits are full of antioxidants, vitamins and fiber.Fruit salad is a dish consisting of various kinds of fruits. Sometimes it is served in their own juices or a syrup or with a yogurt. Fruit salad can be served as an appetizer, a side-salad, snack or a dessert. First wash all the fruits properly. Peel and chop the Papaya into small pieces. Chop the apples and guavas into small pieces. discarding the cores . 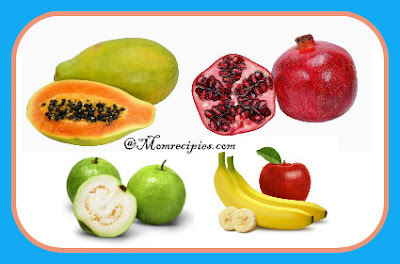 Take a large bowl and mix apple,banana,guava,papaya together well. Add pomegranate seeds and toss together until well combined. Serve plain or with a side of yogurt or with a Greek yogurt mixed with honey.